Fort Roberdeau, also known as The Lead Mine Fort, is a historic fort located near Culp, Blair County, Pennsylvania. 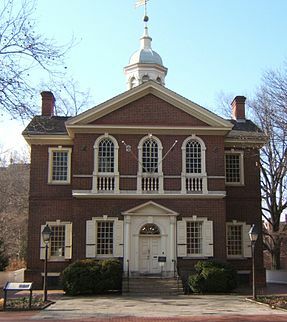 It was built in 1778, during the American Revolution and was occupied until 1780. Initial efforts were made in 1939-41 to reconstruct the fort by concerned local agencies with support from the National Youth Administration. The stockade was finally reconstructed as a Bicentennial project in 1975-76. The original fort was built of horizontal logs with a bastion at each corner. 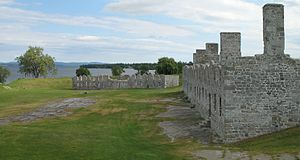 The fort was originally erected by General Daniel Roberdeau to protect local lead mining activities from the Indians and Tories. 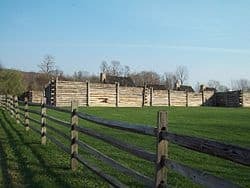 The fort is open to the public as a historic site, administered and owned by the County of Blair, PA. 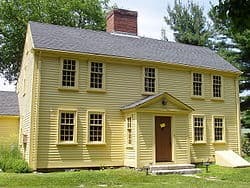 The site consists of the reconstructed fort and its structures (officers’ quarters, storehouse, barracks, blacksmith shop, lead miner’s cabin, powder magazine, and lead smelter), a restored barn (1859) which serves as visitor center, a restored farmhouse (ca. 1860), a sinkhole, a trail system, and a log house (2012) built in the style of an original frontier house. The site is open May 1 through October 31.